In honor of International Holocaust Remembrance Day, the Holocaust Commission of The United Jewish Federation of Tidewater, The Norfolk Forum, and The Virginia Beach Forum present an evening with world-renowned historian, forensic detective, and humanrights activist Father Patrick Desbois. He will discuss the findings of his decade and a half-long investigation into the heinous genocidal Nazi death squads in Eastern Europe, revealing the system they applied to gain the complicity of local townspeople in the many killing fields as described in his book, The Holocaust by Bullets. Fr. Desbois will also speak on the rapid growth of anti-Sematic rhetoric and organized violence throughout the world and offer his counsel to those seeking to resist it. A distinguished author and professor at Georgetown University, Fr. 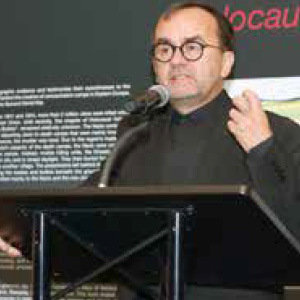 Desbois has dedicated his life to fighting the bigotry that fuels the disease of genocide. His work calls for legal justice for the perpetrators. He is the founder of Yahad-In Unum (www.yahadinunum.org), a non-profit organization dedicated to discovering genocidal practices wherever they are found around the world, providing documented proof of crimes against humanity, and a leading voice of protest on behalf of all past and present victims of mass murder. Fr. Desbois is the winner of the 2008 National Jewish Book Award. He has received numerous honors including the 2018 Anti-Defamation League Kay Family Award and the 2017 Lantos Human Rights Prize. Yahad-In Unum and Desbois have been lauded by world leaders including Pope Francis and French President Emmanuel Macron. He resides in Washington, DC , and Paris, France. Tickets are $25 and are available at www.thenorfolkforum.org.